The Bentley Scottsdale Polo Championships takes place every fall outdoors at WestWorld of Scottsdale. So what’s taking place this weekend indoors at Barrett-Jackson as the world-famous collector car auction takes over all of WestWorld may intrigue you. Saturday and Sunday will be the first time arena polo is played at Barrett-Jackson, inside in the climate-controlled Equidome. It’s located right next to all the action and provides thousands of seats right next to the action. Arena polo is played on dirt not grass and features more scoring and more physical action than outdoor play. And this weekend’s arena polo action isn’t just any match or matches. It includes The Townsend Cup, an annual competition between England and the United States since 1928, featuring the best players in the world. The Townsend Cup has never been played in Arizona before. Other matches include military teams and top collegiate players from both countries too. Check out the whole schedule at ThePoloParty.com/Arena/. Tickets are simple. 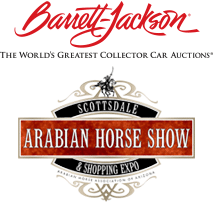 Buy a General Admission for Barrett-Jackson either Saturday or Sunday, and admission to the polo matches is free. Tickets start at just $17. And if you want reserved VIP seating in the first or second row or mid-arena, it’s only an additional $30. It’s easy to purchase both options by going to ThePoloParty.com/Arena/. If you have any questions please don’t hesitate to call us at 480.423.1414 or email us at info@ThePoloParty.com. We look forward to seeing you Saturday and Sunday at Barrett-Jackson for the first-ever Arena Polo Party featuring The Townsend Cup.